PLOT A secret agent is assigned to track down three missing orbs of plutonium. BOTTOM LINE Twelve years in, Cruse delivers another thrilling episode of this espionage-action series. Why does Tom Cruise do many of his own stunts in “Mission:Impossible — Fallout”? Keeping it real has been a point of pride for Cruise since the action franchise launched in 1996, although at this point — Movie No. 6 — nobody would blame him for stopping. Anything Cruise does, whether car chase or free fall, could be convincingly staged using stand-ins, green screens and digital trickery. Yet here is Cruise, 56, performing some of the most impressive feats of derring-do ever captured on screen. Yes, that's really Cruise, as secret agent Ethan Hunt, jumping out of a Boeing C-17 military transport plane at 25,000 feet. That's really Cruise driving a vintage BMW down a stone stairway in Paris, sprinting across London rooftops and, in the film's most spectacular sequence, piloting an Airbus helicopter into a dizzying spiral (Cruise also operated the camera). The realism doesn't make the plot any more believable, but then, it doesn't need to be. Like the television show that inspired it, the “M:I” franchise deals in action-driven, authoritative-sounding nonsense. Originality is not the goal: Would you believe that in “Fallout,” Hunt and company must track down some missing plutonium? Returning to Hunt's side are Ving Rhames as the unflappable Luther and Simon Pegg as tech wrangler Benji, who this time gets “out in the field." Two faces from the previous film are back: Rebecca Ferguson's alluring Ilsa Faust, once again striking a welcome note of mystery, and Sean Harris' free-ranging evildoer Solomon Lane, now a bearded Unabomber type bent on cleansing Earth. There are two enjoyable new characters: a meddlesome CIA agent named Walker (a deadpan Henry Cavill) and The White Widow (Vanessa Kirby), an elegant criminal with platinum hair and a well-hidden shiv. 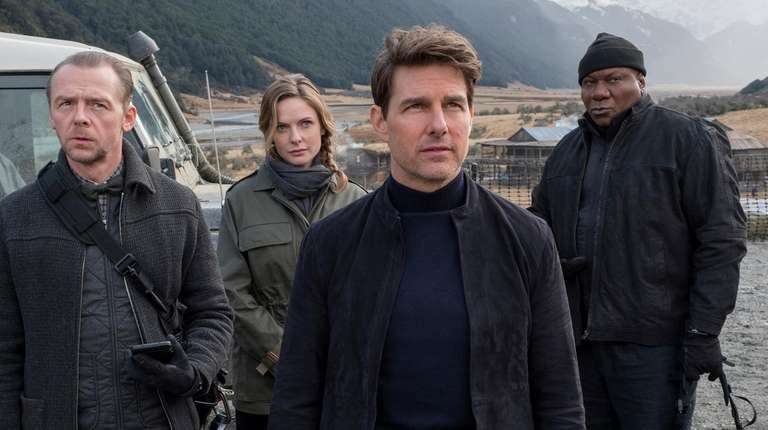 Writer-director Christopher McQuarrie, on his second “M:I” film, keeps this elaborate machine purring like a luxury sedan with only the occasional misfire. The plot gets so tangled in mental chess and double deceits that the characters often sound like internet conspiracy theorists (“Don't you see? This is the trap!”). The film also devotes too much time to Hunt's ex-wife, Julia (Michelle Monaghan), who makes a better back story than a character. Nobody goes to an “M:I” movie to have their heartstrings tugged. We go, of course, to see Cruise drive that motorcycle, fly that chopper, clear that roof. Why does he do it? Corny as it sounds, the answer has to be commitment — and we see it, even if only subconsciously, every time he's on screen. That's why he does it, and that's why we keep showing up.